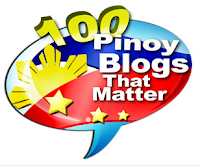 Home BUDOY DATING AND RELATIONSHIPS GERALD ANDERSON JANICE DE BELEN KIM CHIU KISS SCANDAL MAJA SALVADOR PHOTO SCANDAL SCANDALS Maja Salvador, LOOK: Gerald Anderson kissing Janice de Belen in viral photo! 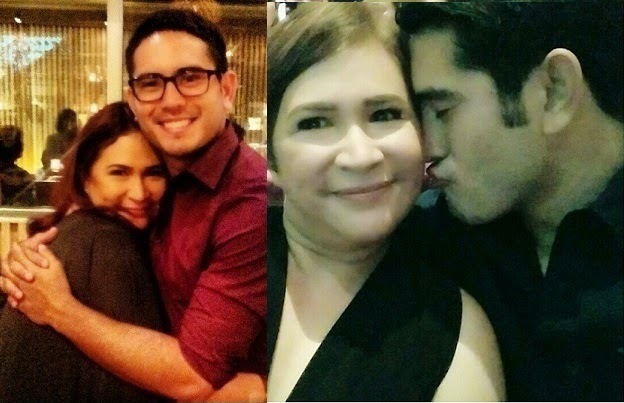 Maja Salvador, LOOK: Gerald Anderson kissing Janice de Belen in viral photo! 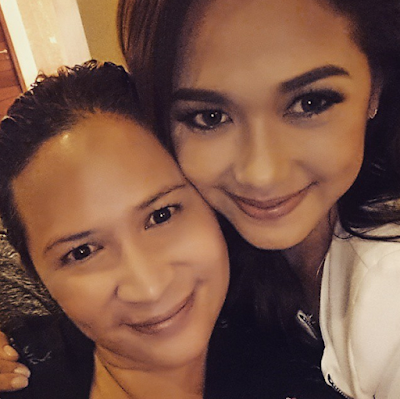 Maja Salvador and Gerald Anderson broke up because of Janice De Belen? Seriously? 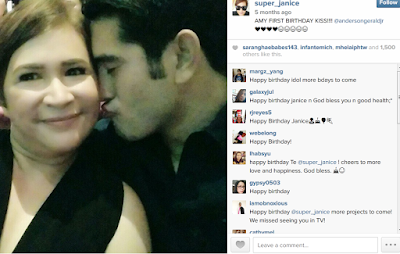 Following the news about Gerald Anderson and Maja Salvador breakup, netizens were quick to point finger to Ms Janice De Belen, who played mother to Gerald in the 2011-2012 soap "Budoy", as the 3rd party who allegedly caused the breakup and then this viral photo of Gerald kissing Janice have started to get viral online. Janice de Belen, who is 20 years older than Gerald, also portrayed mother to both Maja Salvador and Kim Chiu (now they're both Gerald's exes) in 'Ina, Kapatid, Anak', which ran from late 2012 to mid-2013. But Janice still is closer to Gerald than the 2 girls, their "friendship" now spanning more than 4 years which started when they worked together in "Budoy". Maybe there in the extra closeness they have for each other that people put malice on, that they have been linking Janice to Gerald, much more now that the latter has already broken up with girlfriend for 2 years, Maja Salvador. Many also noticed how determined Janice is on getting slimmer, and that she looks "blooming" lately. 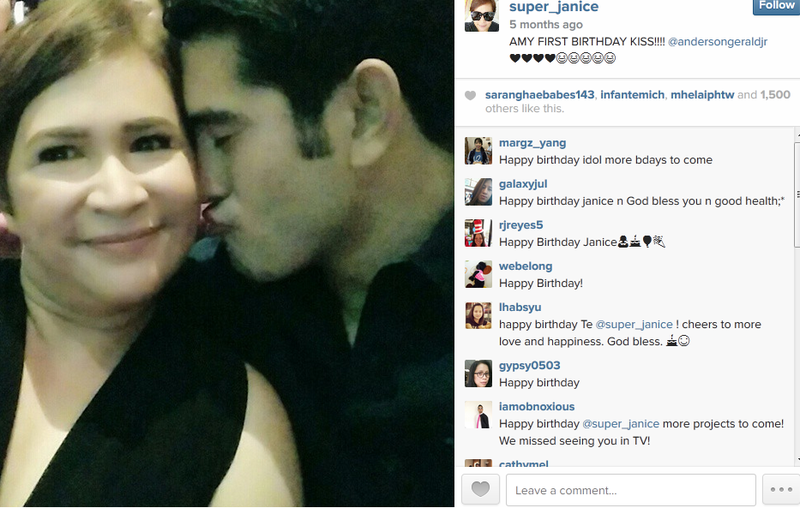 The kissing photo was actually posted by Janice herself via Instagram taken during her birthday last November. According to its caption, Gerald gave Janice her first birthday kiss that day. It's really sweet! For some, they looked like a couple there, celebrating one sweet special moment together, with Janice happily sharing that it was Gerald who first kissed her on her birthday even including 4 hearts in the photo's caption. Is it true that Maja Salvador couldn't stop being jealous of Ms. Janice de Belen within those 2 years of her relationship with Gerald? Maybe not, 'coz Maja is also close with the senior actress and they're also seen together just last March during the reunion for the cast members of 'Ina, Kapatid, Anak'. But maybe yes, especially with the way they smiled in their pictures together. There's something in their smiles. (It's like they want to k-ll each other? Just kidding!) Look! 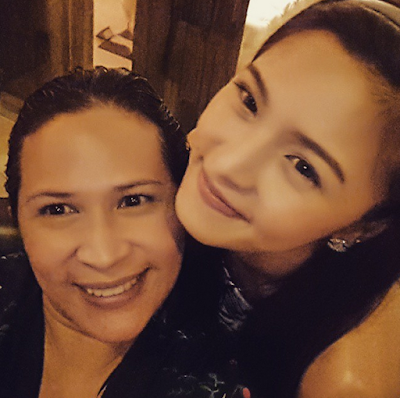 And it's much different when compared with Janice's photo with Kim Chiu. Both pictures were shared by Janice in her IG account @super_janice. This is true.... Janice is the reason why they broke up. I saw them when they were passionately kissing in a very secluded place (whose access is by membership) in Batangas. I commented on Janice's Instagram account there and then and she blocked me instantaneously. Even Gelli De Belen knows this is happening. Maja even caught them at one point. The judges are often very confusing. One judge will want the contestant to imagine being on a radio show and sing accordingly while for the following contestant, the same judge will want the contestant to take advantage of the entire stage, be more active. They are not constant in their mentoring and they should be much more careful with their comments.